The photos app is the default image viewer on Windows 10. Out of the box, Photos app supports a wide range of image formats. Add to that, the photos app is pretty good looking while being snappy and responsive. However, out of blue, I've been seeing blurry images in Photos app on Windows 10. Since I take a lot of screenshots, I quickly found the issue and it is very inconvenient. This is especially evident in images that contain a lot of letters. To give you an idea, I've taken a screenshot of the Photos app displaying an image containing a lot of letters. On the left side is the screenshot of the photos app and the right side is the actual image. As you can see from the image comparison, the left image is blurry and hard to read. Click on the image to enlarge it. After doing a bit of research, I found that this happens due to corrupted files or cache. The corruption happens under certain circumstances like system crashes or power failure. The good thing is, it is easy to fix blurry images in photos app on Windows 10. Let me show you how. You can easily fix blurry images in photos app by resetting it. This is just like the resetting Microsoft Store app. 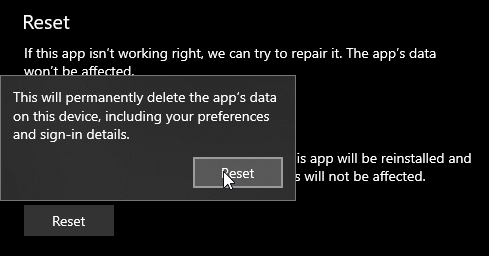 When you reset a Microsoft store app, Windows will invalidate the cache, discard all the settings, reinstall the app, and reset all the app settings. Since this is essentially a clean install with no corrupt files or cache, it should fix the blurry images problem in the photos app. Press Win + I to open the Settings app. Go to "Apps -> Apps and Features". Find "Microsoft Photos" on the right panel and click on it. Click on the "Advanced options" link. You will see a warning prompt, click "Reset" again. Windows will now reset the photos app. After resetting, you will see a checkmark right next to the Reset button. That is all. From now on you will not see blurry images in Photos app. If you see blurry images again, follow the above procedure. That being said, if the Photos app is misbehaving constantly, I recommend you to use IrfanView. IrfanView is an awesome open-source and free image viewer for Windows that supports almost all the image formats, including raw images all the while being faster and responsive. Download IrfanView (32-bit) or IrfanView (64-bit) from Microsoft Store. You can also download the regular win32 app from here. Here are some other fixes for problems you might have with Windows 10.